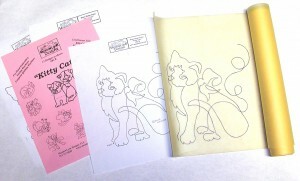 TRACING – Place the paper pattern on a light box, an empty picture frame with glass, or a window. Tape in place. Next place the fabric over it and center it using the convenient centering cross-lines. Tape in place. Trace the design onto the fabric with a.) a washable marker or washable fabric marker; b.) a disappearing marker; c.) tailor’s chalk pencil; d.) a carbon leaded pencil that will wash out. There are lots of great products on the market! You can even get a white Clover marker to use on dark fabrics. 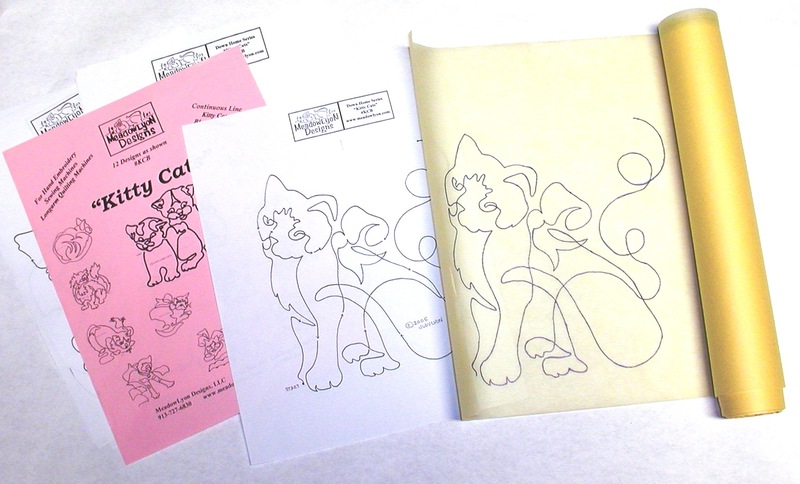 CREATE A STENCIL – Option A – Stitch through the paper pattern and after placing it on the fabric use a pounce pad to make through the “stencil.” This is convenient if you need to transfer the same design many times. Option B – Lay :” Bridal Tulle” over the pattern and trace with a fine line, permanent marker. When you want to transfer the pattern, lay the Tulle over the fabric, pin in place, and draw over the line with a chalk pencil. The chalk line will go through the holes of the Tulle to the fabric. TRANSFER PENCILS – The latest tool is a great one. The transfer pencil (made by Fons and Porters and other brands too) create an iron-on stencil just like the old embroidery transfers. Simply turn the block pattern over, place it on a light box or window, and draw the line on the back of the block. When you’ve finished you’ll be able the place the block (right side up) over your fabric and “iron on” the stitching line. LONG-ARM MACHINE QUILTING – Of course you can place the pattern on the bed of your quilting machine table and follow the line with your laser or pointer. If you’re working from the front of the machine, DeLoa Jones suggests you place the pattern on a cookie sheet and adjust the laser to the page. You’ll still need to find the center of the block and direct your laser to that point. Then you can move to one of the starting points on the continuous-line block pattern and begin stitching.